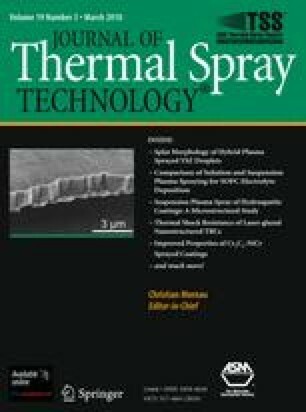 This research examined the influence of processing parameters on the structure of a Ni-50Cr coating applied by high-velocity oxy-fuel spraying onto stainless steel specimens. This type of coating is normally used as protection against heat and corrosion encountered in power plant and marine boilers, and oil refinery heaters. A statistical design of experiments identified fuel and oxygen flow rates and spraying distance as the most influential parameters controlling the in-flight characteristics of the powder particles prior to impact. The effects of these parameters on the porosity level, oxide content, and microhardness of the coatings were then investigated in more detail. These results indicated that the oxide content and hardness of the coatings were dependent on the gas combustion ratio but not on spraying distance. The porosity level and amount of unmelted particles were reduced at the longest spraying distance. Thanks are expressed to Dr. Larry Pershin and Tiegang Li for help with deposition of the coatings. Partial support for J. Saaedi during the course of this work was provided by the Centre for Advanced Coating Technologies (Prof. Javad Mostaghimi, Director).